I thought this was a nice, little waterfall. 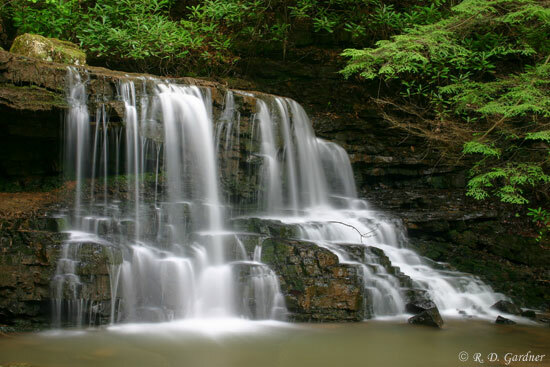 Laurel Run Park is a great place for a picnic and a short hike to the falls. Located just outside of Church Hill, TN on the edge of Bays Mountain and the South Holston River, the setting is quite nice. Actually, The River was filmed here. Laurel Run Creek and its watershed is small so don't expect an overpowering waterfall. Still, its a great place to spend an afternoon with the family. A double bonus is nearby Kiner Creek Falls, reached by continuing on the trail past Laurel Run about 1/4 mile. Laurel Run Park is located just to the west of Kingsport, TN. Directions can be obtained from this website on Tennessee vacations. It is well marked with signs at every intersection. Take 11W west out of Kingsport and turn left at the traffic light on the other side of Church Hill. There will be a sign. After turning, the road will cross the Holston River. Look for another sign and turn left. After that, the road will loosely follow the river to the park. There may be one more intersection where you should bear left. The trailhead is at the back of the park. Essentially, find Laurel Run Creek and follow it. Don't follow the marked trail! Ok, that sounds weird but it's true. Your best bet is to follow the old access road along the creek when leaving the park. The trail will eventually tie back into the larger path after doing some excessive up-and-down stuff. Don't worry, you can't get lost. You're just following the creek after all. There are a couple of stream crossings. I was told that wading would be required. Under higher flow conditions I would agree. The day I visited, my sons and I were able to take the first crossing on an old 1x8 board and the second crossing was done by rock hopping. The elevation gain on the hike to Laurel Run Falls was gradual and not excessive. See the hike profile below. The hike is through a very pretty area, quite reminiscent of the Great Smokey Mountain National Park. Rhododendrons abound on this hike so it's especially pretty during their bloom. God smiled on me when I was there. Although I visited in the middle of the afternoon, wind was negligible and an overcast sky helped with exposure. Actually, the hills are steep on both sides of Laurel Run Falls so any time but around midday should be decent. I didn't find any hidden or tricky angles for photographing this waterfall. Obviously, try some different locations and compositions so you have plenty of nice pictures to choose from when you get home. Without a tripod you will be sorely disappointed in how your pictures turn out. I took some while hand holding the camera to get my boys in the picture and the waterfall was not much to see ( 1/60th sec. shutter speed). 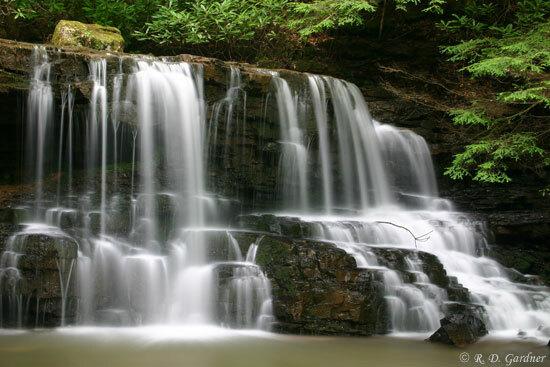 A normal-to-wide angle lens will be required as you are very close the waterfall. There are no problems with bright skies or horizon issues but if the sun is out or if the clouds are thin you could have problems with overexposure on the water. Try bracketing some, about 1/2 stop underexposure or so.